German's 1,700km run mission for rainforests | Daily Express Online, Sabah, Malaysia. Kota Kinabalu: A retired German civil engineer will embark on a 1,700km run to raise awareness on saving one of the very few remaining rainforests.Hailing from Nürnburg, Germany, Andreas Bussinger, 28, will start his mission from The Tip of Borneo, Kudat to Pontianak, Indonesia at about 4am on July 15 (Sunday). He said the run is a collaboration with Lightup Borneo, a non-governmental organisation (NGO), with the mission to raise awareness on promoting electricity and lighting as well as clean energy in Borneo's vast interior filled with remote villages as well as raising RM50,000 for the NGO. "A run across Borneo has never been done before and therefore setting myself for the mammoth task of running over 1,500km through Borneo will be a new 'record'. "The unpredictable here is I can experience blazing hot sun for one moment and complete wash of rain next. "This is not an easy endeavour, with mosquitoes, steep hill climbs as well as temperature and humidity close to 100 per cent, but I am prepared for blood, sweat and tears," he told a press conference at Lightup Borneo HQ, here, Wednesday. Andreas said he is not a professional runner and has never run over 20km at one go in his life but with his strong will, dream and vision, he is prepared to go great length with determination. "I have been training every day for two hours for the past few months and I plan to run in the wee hours and late evening to avoid the hot sun," he explained. 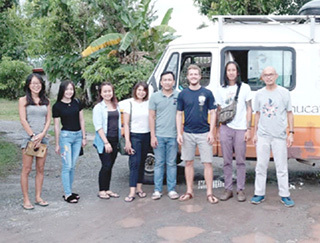 Prior to this, Andreas along with his wife, Kim Min Jong, 32, and their two children had set off from Germany to Peninsular Malaysia in a Mercedes-Benz 310D campervan before setting foot on Borneo. In the past two years, he traversed through 25 countries, experiencing the vast cultures of different countries such as Russia and China. He had also toured around Sabah for three weeks before initiating this project. Andreas had also been involved with several other projects in the country prior to this, including Rhino and Forest Fund, Sepilok Orang Utan Rehabilitation Centre, as well as an Orang Asli community in the peninsula.